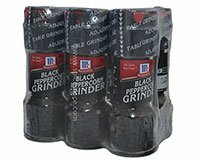 Bring distinction to the dining table with McCormick Black Peppercorn Grinders in glass container. Versatile black peppercorns lend bold flavor and pungent aroma to enhance nearly every dish. Grinding spices at the moment of use releases essential oils, and brings out the full flavor and aroma. This stylish grinder adds unique appeal and allows customers to freshly grind their own black peppercorns at the table. The attractive disposable bottle lends to higher perceived value to your operations and is designed to eliminate refilling, which saves on labor. Branded packaging on your tabletops signifies quality. The look of the tabletop sets expectations for the whole dining experience. Contains 6 individual Black Peppercorn Grinders each containing 1.85oz (24g) of Black Peppercorns. Disposable: Do not refill.